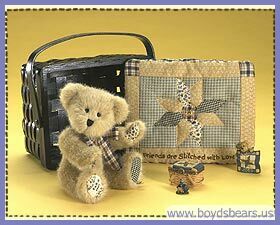 Boyds 2009 FOB Club Kit, Introduced for Spring 2009; The way we see it, quiltin� is a lot like friendship. It takes a whole lotta love, time and patience to be good at both. And like a quilt is stitch..
Boyds 2009 FOB Club Kit, Introduced for Spring 2009; The way we see it, quiltin� is a lot like friendship. It takes a whole lotta love, time and patience to be good at both. And like a quilt is stitched with love, so too are the friendships we form and the memories we make. This year's Club Kit is sure to bring you a year's worth of love, friendship and the homespun goodness every Quiltin� F.o.B deserves. Keep reading to find out just what else you'll get when you become a 2009 Quiltin' F.o.B.! ** Offishull Boyds seasonal catalogs (mailed with membership card) ** Online Newzletter & Chat Room Opportunities to learn about Boyds Stuff ** Advanced preview of product introductions! ** Members-only website access ** Members-Only Exclusive Stuff!